Comprehensive IT Support | Digital Seattle, Inc. | Seattle, Washington | Digital Seattle, Inc.
Computer and network support for Greater Seattle Area small and midsized businesses. Downtime is a profit killer. At Digital Seattle, we recognize that in order to maximize profitability, your company’s IT has to be up-and-running. That’s why we provide comprehensive IT support to small and midsized businesses in the Greater Seattle Area area. Our computer support services are delivered in an affordable, monthly rate based on the hardware you have in place. Take advantage of optimal uptime and experience for yourself the benefits that Digital Seattle’s managed IT and computer repair services present businesses like yours. Your computers will fail. Through wear-and-tear, any system’s internal components will eventually break down, leaving you to pick up the pieces. Fortunately for you, the IT professionals at Digital Seattle possess the expertise to provide a thorough analysis of almost any piece of computing hardware or accessory. Our ability to determine the root of a problem, find a solution for the problem, and implement a solution sets us apart from the competition. With our fast and accurate analysis, we are then able to fix or replace the malfunctioning piece of hardware and get it working again quickly, limiting downtime. In the information age, software drives business. Software companies know this. In order to keep running the most current versions of productivity or management software, you will need to acquire the licenses needed to accommodate your the computing your staff needs. At Digital Seattle, we take handle software licensing to make sure that your company’s software is up to date and delivered properly. Whenever your employees experience a major IT issue, it takes a serious toll on their ability to be productive. This is especially true if the problem exceeds the technical knowledge or capabilities of your business’ “go-to” IT person. 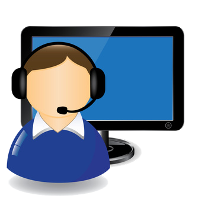 To remedy this, Digital Seattle offers Help Desk Support as an optional part of our Comprehensive IT support service. For more information about how Digital Seattle’s professional IT technicians can present your organization with a high-degree of value, please take a minute and fill out the form on the right-hand portion of the screen, or simply give us a call at (206) 709-9556.